OK, OK, so it sounds like the start of a bad joke. But it's not. Israel has been suffering from a lack of rainfall, and Israelis, both secular and religious, are pulling out all of the stops to bring about a reversal of fortune. The rain, which usually falls this time of year, has not come, and forecasters predict no change in the weather through part of December. The situation has caused an unusual unity in the country. 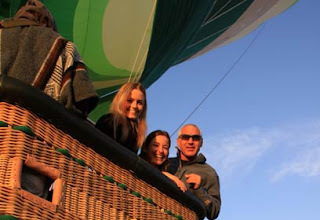 Rabbis and a beauty queen in a hot air balloon. Jews, Muslims, and Christians in an interfaith prayer service. It would take something like a severe drought to bring these diverse groups together. Last week, Jews, Muslims, and Christians gathered in Al-Walajah, a Palestinian village between Jerusalem and Bethlehem in the West Bank, part of Israel's Jerusalem municipality, for an interfaith prayer service asking for rain to start falling. 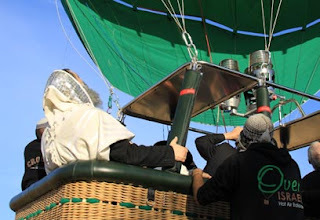 Before dawn on Thursday, Rabbis Menashe Malka and Reuven Deri boarded a hot air balloon and ascended 1,000 feet in the air in order to pray for timely rain. The two were joined by Eshkol Regional Council Head Haim Yalin and Sdot Negev Regional Head Council Meir Yifrach, as well as beauty queen Shavit Wiesel and other worshippers. The group, which took off from an open field near Kibbutz Ruhama in the Negev, was equipped with a prayer for rain drafted by late Rabbi Mordechai Eliyahu. Hot air balloon operator Moran Itzkovitz said that "a joint prayer, while looking down at the amazing scenary of the dry Negev fields, may open the gates of heavens and strengthen farmers across the country." Also on Thursday, worshippers gathered in the northern town of Hatzor HaGlilit, at the tomb of Honi HaM'agel, who became famous for his ability to successfully pray for rain during a year of drought. The prayer was attended by chief Rabbis Yona Metzger and Shlomo Amar, council heads, rabbis and yeshiva students from the surrounding areas. The worshippers blew the shofar and recited a special prayer authored by Rabbi Metzger. On Wednesday, dozens of Rabbis and guests gathered for a mass prayer for rain on board the Ein Gev tourist vessel at the Sea of Galilee. We like to include a video clip in each of our blog posts, but we couldn't find a clip of the balloon launch. The best we can do is share a short clip of Shavit Wiesel introducing herself as Miss Israel 2010. We hope you'll accept that in lieu of a balloon video. May her merit and that of her rabbi co-passengers on the balloon persuade the Almighty to open the skies and bless Israel with much needed rainfall.